I am not sure what to think. Edited title for capitalization - Prospero. It's certainly an interesting read, though really it sounds more like lucky guess-work than anything else and/or idle chit-chat taken out of context (the supposed overheard conversation. We'll see what happens - the main disappointment is, that it really is only speculating a set reprinting non-reserved list cards. As fine as that might be, it's not really going to change much for Vintage (and I suspect even Legacy given a) the price of duals and b) the lack of opportunities to play now SCG is largely withdrawing support). Still, the piece was good. It's a good yarn and entertaining read. Let's see what happens. So Eternal Masters, old bordered begrudgingly with a hologram with only non reserved list cards might help a bit but mana bases are still the most expensive cards. Another problem for this set is appealing to eternal players would mean keeping the art, which would mean royalties in some cases. I guess they did it with Time Spiral so there is precedent. I suppose they could put the photoshop WoW trash in old border. Either way the originals will just continue to go up given the demand increasing. 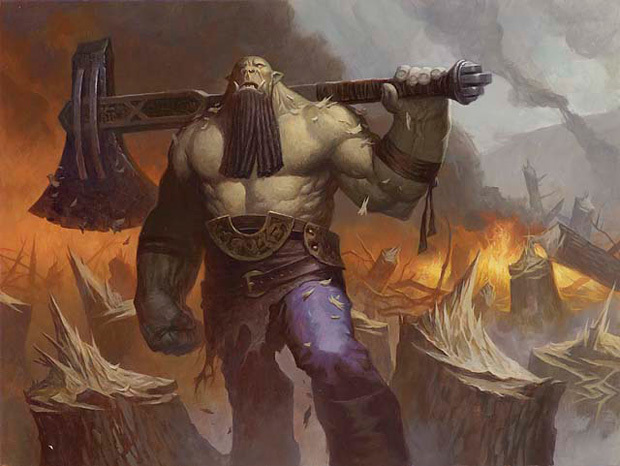 Or how about the mythics as old bordered ? Maybe choose a couple of eternal themes to help drafting, plenty of tribal (Rath Block Slivers, Merfolk, Elves, Goblins, Soldiers all have some things that could use a reprint). Put the Zendifetches @ Rare to help squelch the cries. Wait...so the basis for believing in this "Eternal Masters" set is some statements from the temp account of some guy on reddit who "leaked" that Splinter Twin and Summer Bloom would be banned? And he claims he has this information because he overheard two vendors talking about it at a GP? First off, I don't even play modern and I could have told you the Amulet Bloom deck was getting a ban. You almost couldn't help hearing about how broken it was, how it wins too early, etc. No inside information needed. Twin I take it was less expected, but again, I don't even play modern and I overhear complaints enough to know that it's good and some people don't like it. Doesn't seem like a totally unreasonable claim to throw out there if you're just looking to stir things up (this is the internet after all). Then, when it turns out these two things are true (which really came down to a near sure thing and a reasonable guess), all the sudden the rest of this guy's story has some credence? I mean, if you think some vendors at a GP loudly discussing inside information like that is a high probability event then sure. Otherwise I'm not sure this really sways me much. Compared to the probability that wizards leaked the existence of Eternal Masters to vendors, times the probability that those vendors would loudly discuss said information at a GP for this guy to overhear, times the probability that this guy then decides to leak it on reddit: idk but I'll take the other one. Let's play devil's advocate here, and assume that the information regarding Eternal Masters is correct. I think the individual is intentionally obfuscating the source of the information. Again, we're assuming that this is all accurate, so we're going to cast aside our doubts here, and just run with it. If that's the case, I'd imagine that they're looking to hide the source of the information because it enables them to stay hidden. I wouldn't buy the 'overheard it from some dealers' line, mostly because keeping secrets grows exponentially more difficult the more people that you involve, and if multiple vendors knew, I would fully expect this to be very public by now. Which leaves me thinking that (if this is accurate), it's a source with direct access to Wizards who wanted to put this out there (for whatever their reasons were) while maintaining a cloak of anonymity to protect the relationship that they have with Wizards (which they don't want to jeopardize). If we address the content of the information, then this is a pretty cool thing. The releases of Modern Masters I & II have only pushed the price on some staples higher (remember when Goyf was $50? ), but it has definitely gotten some people into the format, and it increased the supply on cards that were growing more expensive than they probably should have been. I had picked up a set of German foil Arcbound Ravagers a while back, and I paid $50 per on them. I thought it seemed high at the time, but I wanted them in case I decided to play Affinity. I have built a second Shop deck with non-foil, English cards (and some proxies) and I needed to pick up a set of Arcbound Ravagers for it. Those Ravagers ran me $140, which was $20 under the market value at the time. I was more annoyed that Sword of Fire and Ice ran me just as much. A release of an Eternal Masters set will, at the very least, put more cards out there. Given that Modern Masters has been run as a successful Limited format (attendance at the last G.P. Vegas was record-setting), I'd expect Eternal Masters to be a Limited format as well (for a short period of time). Just having people opening Wastelands, Rishadan Ports, and other expensive Eternal cards that aren't on the Reserved List would be tremendously exciting. How many new players would this net us? Proselytizing for Vintage can be difficult (you want to try and recruit younger players so that they can step up and account for natural atrophy), but having people opening expensive cards in packs (that will hopefully either push down the price of decks by nature of the card's inclusion, or trade for cards that are included in said deck) can only help. Coupled with the recent announcement regarding Wizards' view of 'playtest cards' used in unsanctioned events, this could help us grow the format further. Of course, it could be a line of nonsense, sparked by someone who just wanted the attention, but, naturally, I'd like to believe otherwise. It makes sense that it would be announced during a Pro Tour, and given the success of Modern Masters, I have to believe that this would make Wizards a tremendous amount of money. As such, it seems to make sense from other perspectives. I tend to think this is accurate, though I've been wrong before. I'm with this guy. We have no basis for believing this is true. Heck, if you dig into this you'll find a web video from the fellow who reported the leak where he basically pontificates about Eternal being a new format for half an hour. Check in with actual data, I say. Time Spiral and Pally are reserved list so they are non starters. But your point is well taken ... a Dark Ritual with some absolutely hideous art is expected. 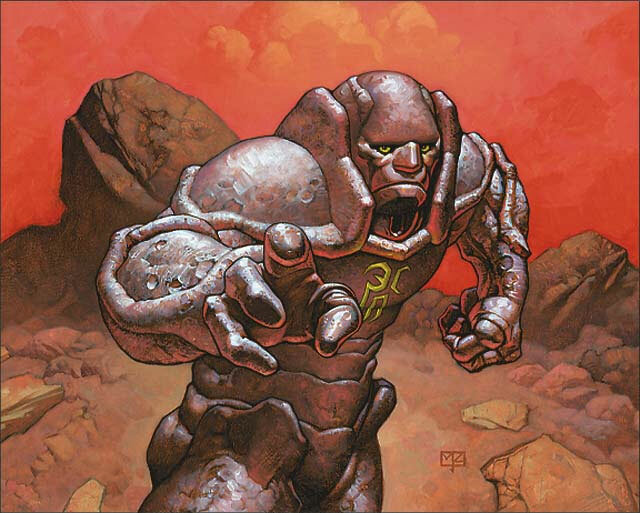 Is the Urza's Saga art too much to ask for! The Saga art was already reprinted in one of the Duel Decks, I think the Phyrexian one. 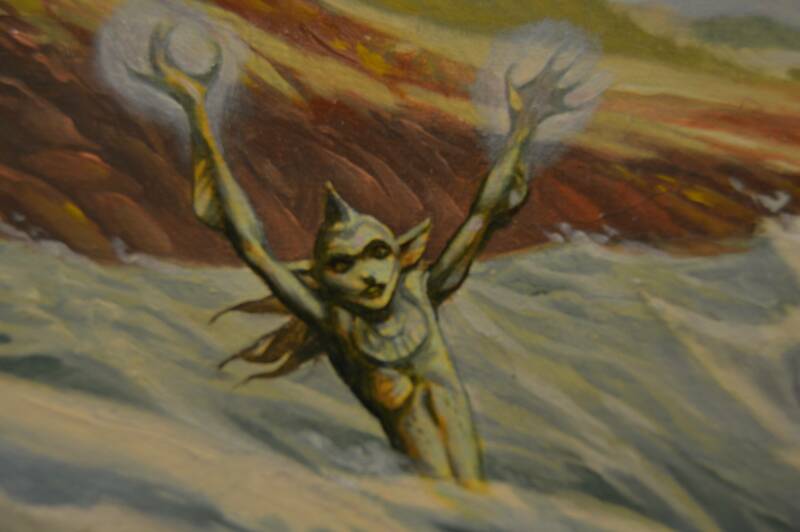 They should really have done the Tempest art in the FTV, or at least the Masques ones. What's the best possible card this set could have for Vintage? Mana Drain? Certainly, Force of Will helps, too, if true. Mana Drain and Force are obvious candidates. Jace, the Mind Sculptor is ~$70 and would be a sensible printing if they don't restrict themselves to recent cards. Wasteland and the Sol lands would be good. Show and Tell is a little high. A lazy possibility, but a reasonable one, is that they will largely use the draft environment for VMA for Eternal Masters or whatever it's called. That was a fun set to draft and due to cost/being online only it was really underdrafted. It would be interesting if Eternal Masters did not have black borders. If it were an accident I think it would be fixed by now. I think it's been removed intentionally by wizards for a reason. Also an interesting distribution of ages. Average yea of release is 2003.9 . Almost exactly half-the-life-of-magic ago. That was printed ten years ago, virtually unprintable in a Standard set, and skipped for Modern Masters, Modern Masters 2015, and From the Vault: Annihilation. Wizards decided after Supreme Verdict that 4 mana unconditional Wrath effects are too powerful for standard - looked for the article in which that was mentioned but I wasn't able to find it after a cursor Google search. In any case, subsequent board sweepers have not broken that rule. Besides cost, it's a Planar Chaos card - It is purposefully outside of Black's slice of the color pie. They're not likely to print such pie-violations in a standard set. Killing creatures is not in blacks pie? Black's slice gets targeted removal and stat reduction removal. Unconditional sweepers are firmly in the white slice of the pie. More semi-mass removal can be found in Gatherer, but vary from having X-in the CMC or only remove a certain creature type. Just got announced. No reserved list cards of course, but Force of Will and Wasteland have been spoiled so far. Is Mana Crypt on the reserved list?